Endotoxin-induced inflammation decreases the hepatic expression of several drug transporters, metabolizing enzymes, and nuclear transcription factors, including pregnane X receptor (PXR). As the nuclear factor κB (NF-κB) is a major mediator of inflammation, and reciprocal repression between NF-κB and PXR signaling has been reported, the objective of this study was to examine whether NF-κB directly regulates the expression of transporters or exerts its effect indirectly via PXR. PXR-deficient (−/−) or wild-type (+/+) male mice were dosed with the selective NF-κB inhibitor PHA408 (40 mg/kg i.p.) or vehicle (n = 5–8/group), followed by endotoxin (5 mg/kg) or saline 30 minutes later. Animals were sacrificed at 6 hours; samples were analyzed using quantitative reverse-transcription polymerase chain reaction and Western blots. Endotoxin induced tumor necrosis factor-α, interleukin (IL)-6, IL-1β, and inducible nitric oxide synthase in PXR (+/+) and (−/−) mice. As compared with saline controls, endotoxin administration imposed 30%–70% significant decreases in the expression of Abcb1a, Abcb11, Abcc2, Abcc3, Abcg2, Slc10a1, Slco2b1, and Slco1a4 in PXR (+/+) and (−/−) mice to a similar extent. Preadministration of PHA408 attenuated endotoxin-mediated changes in both PXR (+/+) and (−/−) mice (P < 0.05). Our findings demonstrate that endotoxin activates NF-κB and imposes a downregulation of numerous ATP-binding cassette and solute carrier transporters through NF-κB in liver and is independent of PXR. Moreover, inhibition of NF-κB attenuates the impact of endotoxin on transporter expression. As NF-κB activation is involved in many acute and chronic disease states, disease-induced changes in transporter function may be an important source of variability in drug response. This information may be useful in predicting potential drug–disease interactions. Drug transporters play a fundamental role in the determination of drug absorption, distribution, and excretion. Consequently, changes in the expression of drug transporters could impact the disposition of their substrates, thereby causing interindividual differences in drug response (Ayrton and Morgan, 2001; Petrovic et al., 2007). Alterations in the expression and activity of transporters and metabolic enzymes have been frequently observed in many acute or chronic inflammatory conditions (Goralski et al., 2003; Hartmannet al., 2005; Morgan et al., 2008; Morgan, 2009). Administration of the bacterial endotoxin lipopolysaccharide is a well-characterized model of acute inflammation that induces a systemic response that exhibits symptoms such as fever, hypotension, and tachycardia, among others (Copeland et al., 2005). Previous studies have found that endotoxin-induced inflammation causes the release of proinflammatory cytokines interleukin (IL)-6, IL-1β, and tumor necrosis factor (TNF)-α and elicits pronounced changes in the hepatic expression of many transporters and metabolic enzymes (Aitken et al., 2006; Petrovic et al., 2007). The endotoxin signaling pathway is mediated by Toll-like receptor 4. Upon stimulation, Toll-like receptor 4 activates a number of signaling pathways, including mitogen-activated protein kinases and nuclear factor κB (NF-κB) (Fig. 1). NF-κB is an inducible transcription factor that is known to be a major mediator of lipopolysaccharide signaling and plays a critical role in acute and chronic inflammatory responses (Lawrence, 2009). The NF-κB complex consists primarily of p50 and p65 subunits, which normally exist in the cytoplasm in an inactive form, bound to the inhibitory IκB proteins. Exposing the cells to stimuli such as bacterial endotoxin or proinflammatory cytokines activate IκB kinases that phosphorylate the inhibitory IκB proteins. This leads to their ubiquitination, degradation, and subsequent dissociation from NF-κB, which permits nuclear translocation of NF-κB. There it can regulate the transcription of many genes, including proinflammatory cytokines (IL-1, IL-6, and TNF-α), chemokines, and inducible effector enzymes, such as inducible nitric oxide synthase (Pahl, 1999; Oeckinghaus and Ghosh, 2009; Hoesel and Schmid, 2013). NF-κB can be selectively suppressed during an acute inflammatory reaction through inhibition of IκB proteins. PHA408 is a selective small-molecule inhibitor of IκB kinase-2 and has been shown to selectivity inhibit the NF-κB pathway in vivo in rodents (Fig. 1) (Mbalaviele et al., 2009; Carlson et al., 2015). In vivo administration of PHA408 was found to decrease NF-κB nuclear translocation and inflammatory response in the lungs of rats exposed to endotoxin or cigarette smoke (Rajendrasozhan et al., 2010). In addition, in vivo oral administration of PHA408 to arthritic rats was shown to efficiently inhibit the induction of proinflammatory cytokines and NF-κB translocation in a dose-dependent manner (Mbalaviele et al., 2009). NF-κB signaling pathway. 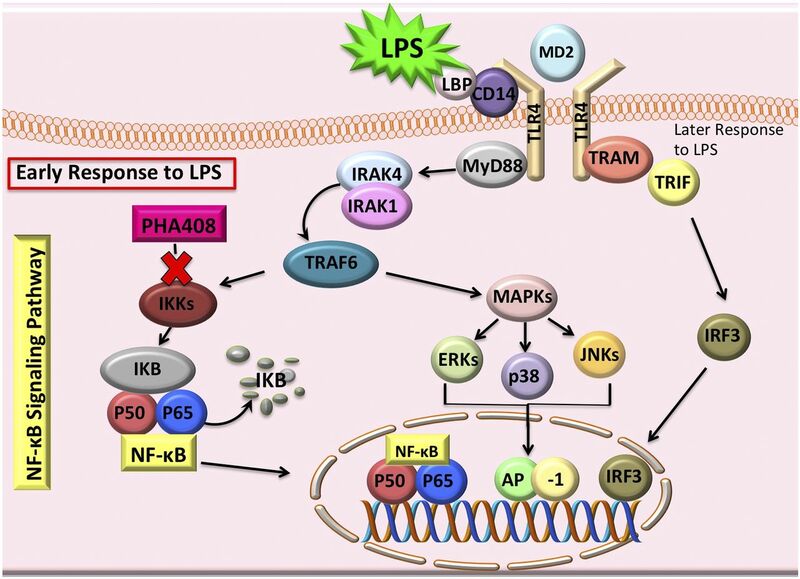 Lipopolysaccharides (LPS) activate NF-κB through a series of cytoplasmic receptors that leads to activation of IκB kinases and degradation of the IκB inhibitory protein, resulting in translocation of NF-κB subunits into the nucleus. PHA408 selectively inhibits IκB kinases. Numerous studies have demonstrated that inflammation-mediated activation of NF-κB decreases the expression of several nuclear receptors, including pregnane X receptor (PXR), constitutive androstane receptor (CAR), and farnesoid X receptor (FXR) (Teng and Piquette-Miller, 2008). It is believed that the downregulation of these nuclear receptors, specifically PXR and CAR, may be involved in the downregulation of the hepatic drug-metabolizing enzymes and transporters during inflammation. Indeed, NF-κB has been shown to both directly regulate CYP gene expression through binding to the NF-κB response element of the promoter regions, and indirectly through NF-κB–mediated repression of nuclear receptors (Zordoky and El-Kadi, 2009). It is well established that activation of PXR leads to the induction of several genes that are known to be suppressed by inflammatory stimuli (Teng and Piquette-Miller, 2005; Morgan et al., 2008). Moreover, it has been reported that PXR is significantly downregulated during acute inflammation and could be partially involved in the downregulation of several hepatic transporters (Teng and Piquette-Miller, 2005). However, the role of PXR during inflammation is still not clearly understood. A crosstalk between PXR and NF-κB has been suggested from results of several studies, in which it is believed that PXR and NF-κB are mutually repressive (Xie and Tian, 2006). Indeed, PXR activation has been found to significantly decrease the expression of NF-κB target genes (Wahli, 2008), whereas silencing PXR significantly increased expression of NF-κB target genes (Mencarelli et al., 2011). Moreover, intestinal tissues from PXR-null mice showed higher levels of NF-κB target genes (Zhou et al., 2006). Therefore, our objective was to clarify the relative roles of PXR and NF-κB in the regulation of drug transporters during acute inflammation. Using mice proficient or deficient in PXR and through administration of a selective NF-κB inhibitor, we examined whether the downregulation of transporters following endotoxin exposure occurs directly through NF-κB signaling or indirectly through PXR. C57BL/6 wild-type [PXR (+/+)] mice were purchased from Charles River Canada (Montreal, PQ, Canada), and PXR-deficient C57BL/6 [PXR (−/−) mice, originally provided by C. Sinal (Dalhousie University, Halifax, NS, Canada), were obtained from an inbred colony. Mice were housed in a temperature-controlled facility and provided with water and a standard chow diet on 12-hour light/dark cycles. The animal study was conducted in accordance with the guidelines of the University of Toronto Animal Care Committee and the Canadian Council on Animal Care. Ten- to 12-week-old male PXR (+/+) wild-type and PXR (−/−) knockout mice were initially administered a 40 mg/kg i.p. injection of the selective NF-κB inhibitor PHA408 (Axon Medchem, Hanzeplein, Groningen, The Netherlands) or vehicle (dimethylsulfoxide/saline). Thirty minutes later, a second injection of 5 mg/kg endotoxin (lipopolysaccharide from Escherichia coli 055:B5; Sigma-Aldrich, Oakville, ON, Canada) or saline was given. Mice (n = 5–8/group) were euthanized 6 hours after the second injection, and serum and organs were collected, snap-frozen in liquid nitrogen, and stored at −80°C until analysis. Quantitative Reverse-Transcription Polymerase Chain Reaction. Total RNA from mouse liver samples was extracted using the TRIzol method (Invitrogen, Carlsbad, CA), according to the manufacturer’s instruction. RNA concentration was measured using the Nano Drop 1000 (Thermo Fisher Scientific, Waltham, MA). cDNA was synthesized using 2 μg RNA, and reverse transcribed using High Capacity cDNA RT kit (Applied Biosystems, ON, Canada). The primers used are listed in Supplemental Table 1. Each RNA sample was plated in triplicate and assayed for genomic cDNA specific for each primer set using Power SYBR Green detection system (ABI 7900HT). Relative mRNA levels were calculated using the comparative threshold cycle method (ΔΔCt), in which each gene of interest was normalized to the endogenous housekeeping gene 36B4. Serum IL-6 levels were measured using commercially available mouse-specific enzyme-linked immunosorbent assay kits for IL-6 (R&D Systems, Minneapolis, MN), according to manufacturer’s instructions. The minimum detectable limit was 1.3 pg/ml. Nuclear proteins were isolated from liver tissue, as described in Supplemental Material (modified from Durk et al., 2014). Total protein concentration was quantified using the Bradford assay with bovine serum albumin standards. Protein samples (40 μg) in Laemmli sample buffer (Bio-Rad, Hercules, CA) were heated at 95°C for 3 minutes and then separated using 10% SDS- polyacrylamide gel electrophoresis and transferred to polyvinylidene difluoride membranes (Bio-Rad Laboratories Canada, Mississauga, ON, Canada). Membranes were blocked with 5% skim milk in Tris-buffered saline (TBST) and incubated overnight at 4°C with anti-PXR.1 (A-20) 1:200 and anti–p-NF-κB p65 subunit (Ser-536) 1:1000 (Santa Cruz Biotechnology, Santa Cruz, CA) 1° antibodies in 2% skim milk TBST. Membranes were washed multiple times with TBST before incubation with 2° antibodies (anti-goat 1:3000, anti-rabbit 1:5000, anti-mouse 1:5000; Jackson ImmunoResearch Laboratories, West Grove, PA). Immunodetectable levels were detected using Super Signal West Pico Chemiluminescent Substrate (Thermo Fisher Scientific) and Alpha Ease FC imaging software (Alpha Innotech, Santa Clara, CA). Gel to gel variability was accounted for by normalizing to a calibrator as well as β-actin (AC-15, 1:50,000; Sigma-Aldrich). Statistical analysis was performed using GraphPad Prism 7 (San Diego, CA) software. All results were expressed as mean ± S.E. Unpaired Student’s t test was used to compare basal gene expression in PXR (+/+) and PXR (−/−) mice. Two-way analysis of variance analysis with Holm–Sidak’s multiple comparison test was used to determine the effect of NF-κB and endotoxin. Basal Hepatic Gene Expression in PXR (+/+) and PXR (−/−). The basal expression of inflammatory markers and hepatic transporters was examined in the PXR (+/+) and PXR (−/−) mice. The basal expression of NF-κB target genes IL-6 and IL-1β was 35%–100% higher in PXR (−/−) as compared with PXR (+/+) mice (P < 0.005) (Table 1). Expression of Socs3, which is an IL-6 target gene, was fivefold higher in PXR (−/−) as compared with PXR (+/+). As compared with PXR (+/+), the hepatic expression of Abcb1a, Abcb1b, Abcc2 and Abcb11, and Slco1a4 was 50%–90% lower in PXR (−/−), whereas levels of Abcg2, Slco2b1, Slc10a1, and Cyp3a were 30%–110% higher in the PXR (−/−) mice (Table 1). Results are reported relative to control wild-type PXR (+/+). Data are presented as percentage of mean ± S.E.M. (n = 5–8), where *significant from saline control, *P < 0.05 ***P < 0.001. Effect of NF-κB Inhibition on Inflammatory Response. In both PXR (+/+) and PXR (−/−) endotoxin-treated animals, the mRNA levels of IL-6, IL-1β, TNF-α, and inducible nitric oxide synthase were approximately 40-fold higher than saline controls. This endotoxin-mediated induction was significantly decreased in mice receiving PHA408 (Fig. 2). PHA408 also effectively inhibited endotoxin-mediated induction of NF-κB mRNA (Fig. 3A), as well as the expression of the active nuclear protein fraction of NF-κB (Fig. 3B) in both PXR (+/+) and PXR (−/−). The effect of PHA408 on (A) mRNA levels of inflammatory markers following endotoxin [lipopolysaccharides (LPS)] administration in the liver of PXR (+/+) and PXR (−/−) mice. Data are presented as percentage of mean ± S.E.M. (n = 5–8), where *significant from saline and #significant from LPS. **,##P < 0.01; ***,###P < 0.001. Effect of PHA408 on (A) NF-κB mRNA expression and (B) NF-κB nuclear protein expression and representative Western blot following endotoxin [lipopolysaccharides (LPS)] administration in the liver of PXR (+/+) and PXR (−/−) mice, and mRNA and protein expression was determined as described in Materials and Methods. Data are presented as percentage of mean ± S.E.M. (n = 5–8), where *significant from saline and #significant from LPS. *,#P < 0.05; **,##P < 0.01; ***,###P < 0.001. In PXR (+/+) mice, serum concentrations of IL-6 were increased from 17 ± 1 pg/ml in saline to 2409 ± 27 pg/ml in endotoxin-treated animals; however, preadministration of PHA408 did not significantly alter this induction (2410 ± 18 pg/ml). In PXR (−/−) mice, serum concentrations of IL-6 were increased from 374 ± 4 pg/ml in saline to 1670 ± 12 pg/ml in endotoxin-treated animals, and preadministration of PHA408 did not significantly alter this induction (1450 ± 14 pg/ml). Effect of NF-κB Inhibition on Hepatic Gene Expression. Administration of endotoxin led to significant 30%–70% decreases in the expression of Cyp3a and the majority transporters, and this occurred to a similar extent in both PXR (+/+) and PXR (−/−) mice (Fig. 4). The inhibition of NF-κB with PHA408 attenuated the endotoxin-mediated changes in both PXR (+/+) and PXR (−/−). In contrast, whereas endotoxin administration increased the level of Abcb1b, this change was not seen in PXR (−/−) mice and was not significantly affected by PHA408. 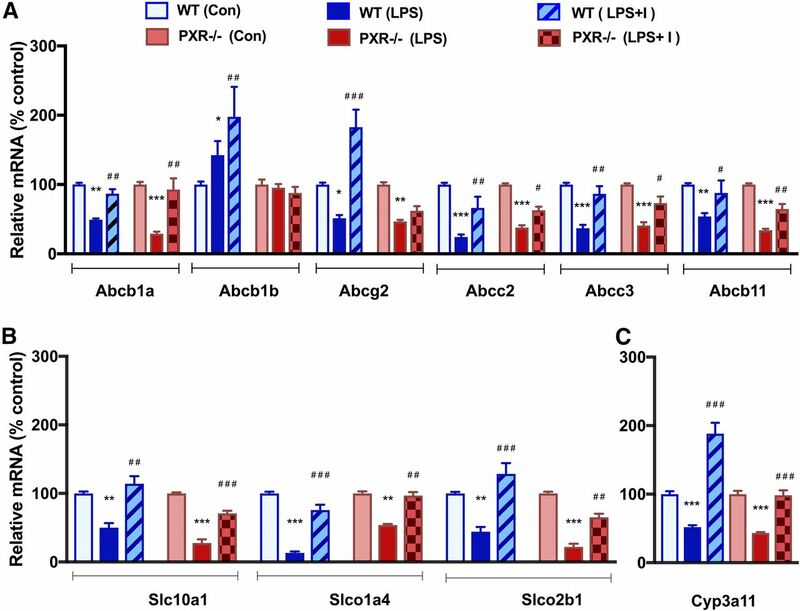 As shown in Table 2, preadministration of PHA408 alone imposed significant decreases in the expression of several transporters in PXR wild-type (Abcb1a, Abcc2, Abcb11, Slco1a4) and PXR-null mice (Abcb1a, Abcc2, Abcc3, Abcb11, Abcg2, Slco1a4, Slco2b1, Slco10a1). Sole administration of PHA408 was found to increase expression of Cyp3a and Abcg2 in wild-type but not knockout mice. Effect of PHA408 on hepatic mRNA expression of (A) ATP-binding cassette transporters, (B) solute carrier transporters, and (C) Cyp3a11 following endotoxin administration in PXR (+/+) and PXR (−/−) mice. Data are presented as percentage of mean ± S.E.M. (n = 5–8), where *significant from saline and #significant from lipopolysaccharides (LPS). *,#P < 0.05; **,##P < 0.01; ***,###P < 0.001. Results are reported relative to saline controls. Data are presented as percentage of mean ± S.E.M. of (n = 4–5) mice; *significant from saline; #significant from LPS. *,#P < 0.05; **P < 0.01. 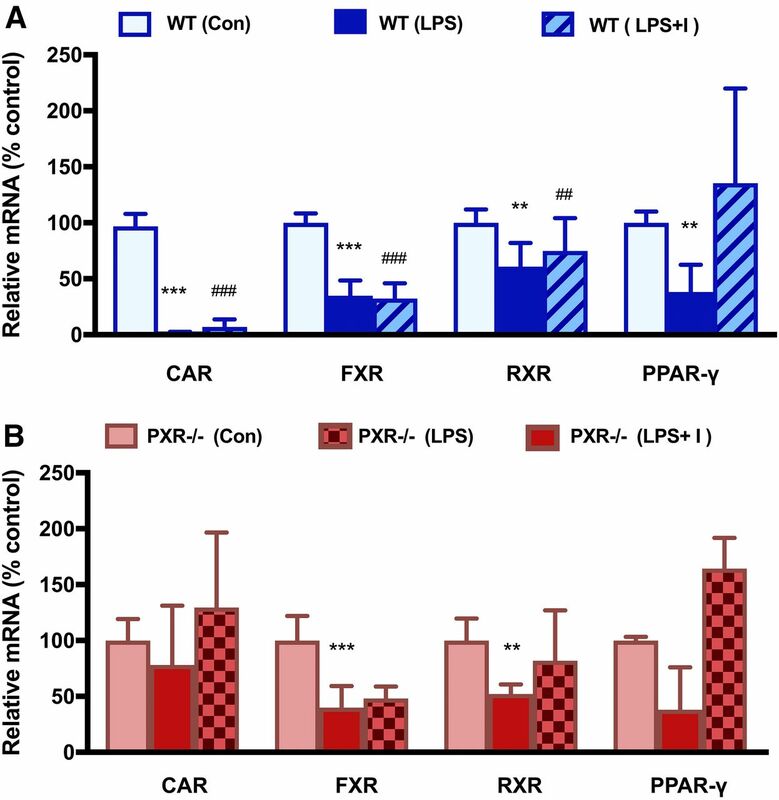 Following endotoxin administration, mRNA expression of PXR, CAR, FXR, retinoid X receptor (RXR), and peroxisome proliferator-activated receptor (PPAR)-γ was significantly decreased in PXR (+/+) mice (Fig. 5A, 6A). Preadministration of PHA408 significantly attenuated endotoxin-mediated effects for only PXR. Consistent with these results, the nuclear portion of the activated form of PXR showed a significant downregulation in PXR (+/+) mice following endotoxin administration, and pretreatment with PHA408 significantly attenuated this effect (Fig. 6). Although a significant increase in PXR mRNA was seen in mice treated with PHA408 alone, no changes in nuclear protein expression were seen (data not shown). Endotoxin administration also imposed significant decreases in the expression of FXR and RXR in PXR (−/−) mice, whereas levels of PPAR-γ and CAR were not significantly affected (Fig. 5B). Preadministration of PHA408 did not significantly impact these endotoxin-mediated changes. Effect of PHA408 on the hepatic mRNA expression of nuclear hormone receptors in (A) PXR (+/+) and (B) PXR (−/−) mice following endotoxin administration. Data are presented as percentage of mean ± S.E.M. (n = 5–8), where *significant from saline and #significant from lipopolysaccharides (LPS). *,#P < 0.05; **,##P < 0.01; ***,###P < 0.001. 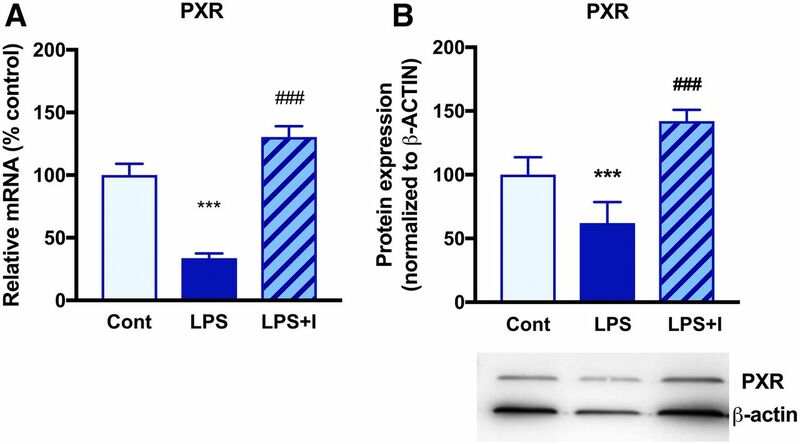 Effect of PHA408 on (A) hepatic mRNA expression of PXR and (B) hepatic nuclear protein expression and representative Western blot of PXR in wild-type mice following endotoxin administration. mRNA and protein expression was determined as described in Materials and Methods. Data are presented as percentage of mean ± S.E.M. (n = 5–8), where *significant from saline and #significant from lipopolysaccharides (LPS). *,#P < 0.05; **,##P < 0.01; ***,###P < 0.001. The acute inflammatory response induced by endotoxin administration has long been associated with a downregulation in the expression of numerous transporters and metabolizing enzymes (Petrovic et al., 2007). The NF-κB signaling cascade is well recognized as the main pathway activated during the early response to endotoxin (Pan et al., 2010). 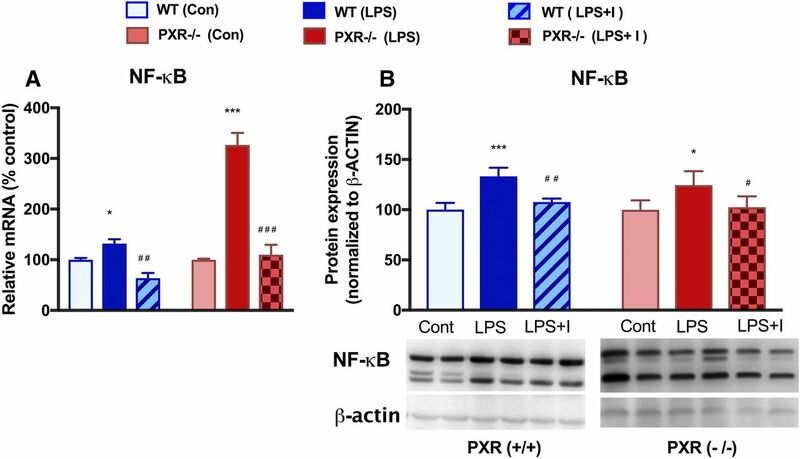 However, few studies have established a direct connection between NF-κB and PXR signaling and regulation of transporters. Overall, this study found that not only does endotoxin administration impose a pronounced downregulation of Cyp3a, transporters, and nuclear receptors, but that these changes were prevented by prior administration of the NF-κB inhibitor PHA408. Moreover, neither the endotoxin-mediated downregulation nor the attenuation with NF-κB inhibition appeared to be dependent on PXR. The NF-κB signaling pathway is well recognized as a major regulator of the inflammatory response (Tak and Firestein, 2001; Lawrence, 2009). Our findings demonstrated that endotoxin administration significantly increased nuclear protein levels of the active phosphorylated form of NF-κB. Moreover, a reduction of phosphorylated NF-κB to that of controls was seen in nuclear fractions obtained from endotoxin-treated mice that were pretreated with PHA408, demonstrating effective inhibition of NF-κB activation. Likewise, induction of proinflammatory cytokines was effectively suppressed. The inhibition of NF-κB was also associated with the attenuation of endotoxin-mediated changes in the hepatic expression of Cyp3a and transporter genes. This indicates a principal role of NF-κB in the regulation of these genes. NF-κB has been previously reported to suppress the transcription of several Cyp enzymes by binding to their promoter regions (Morgan et al., 2002; Zordoky and El-Kadi, 2009). Similar to our findings with Abcb1b, TNF-α–mediated activation of NF-κB signaling was found to induce levels of Abcb1b in primary cultures of rat hepatocytes, and binding sites for NF-κB p50 and p65 have been identified in the promoter region (Ros et al., 2001). Moreover, in cultured human brain endothelial cells, NF-κB activation was reported to decrease expression of ABCB1/P-glycoprotein (Fan et al., 2015). Overall, these studies suggest an important role of NF-κB signaling in the regulation of drug transporters and metabolizing enzymes. Although evidence of crosstalk between PXR and NF-κB has been reported, we found that the endotoxin-mediated downregulation of hepatic transporters and Cyp3a generally occurred to a similar extent in wild-type PXR (+/+) and PXR (−/−) mice. Moreover, the expressions of these genes were similarly attenuated in both strains after inhibition of NF-κB signaling with PHA408. These results indicate that PXR is not involved in endotoxin-mediated downregulation of hepatic transporters and that the downregulation occurs directly through NF-κB signaling rather than through PXR downregulation. Previous work in PXR (+/+) and PXR (−/−) mice found that whereas IL-6 administration imparted differences in transporter expression between the strains, only slight differences were seen after endotoxin administration (Teng and Piquette-Miller, 2005). In contrast, we observed higher basal levels of inflammatory markers in the PXR-null mice, which were also associated with a decreased basal expression of most hepatic transporters. However, higher basal expression of Cyp3a11, Abcg2, and Slc10a1 was seen in PXR (−/−) mice. Although the underlying cause of the increased inflammatory state in the PXR-null mice is not known, an increased inflammation of the small bowel has been reported in PXR-null mice (Zhou et al., 2006). Although it was proposed that intestinal inflammation suggested an increased NF-κB activity due to the absence of PXR, this observed inflammation could also be due to the dysregulation of genes involved in maintaining intestinal homeostasis. In addition to PXR, we observed an endotoxin-mediated downregulation in the mRNA expression of other nuclear hormone receptors that are involved in transporter regulation. For example, FXR is involved in the regulation of Bsep/Abcb11, Mrp2/Abcc2, and Slco10a1 (Tirona and Kim, 2005; Kalaany and Mangelsdorf, 2006; Urquhart et al., 2007). Although RXR is a required codimer of numerous nuclear transcription factors, it has been previously suggested that decreased hepatic expression of RXR, along with decreased expression of the liver X receptor (LXR) and PPAR-α, could be responsible for the downregulation of multiple genes during inflammation (Beigneux et al., 2000). In contrast, preadministration of PHA408 did not significantly alter the endotoxin-mediated downregulation of RXR, FXR, PPAR-γ, and CAR. Therefore, NF-κB may not play a primary role in the regulation of these transcription factors after endotoxin exposure. Nevertheless, whereas endotoxin did not impose changes in the transcript levels of these genes, it is still possible that effects could occur on their activation. To determine whether the effects of PHA408 in endotoxin-treated animals were solely due to NF-κB inhibition or other drug effects, we also examined the effects of PHA408 in saline-treated mice. Of note, we found that administration of PHA408 alone caused a downregulation rather than upregulation of several transporters. As the serum concentrations of IL-6, a proinflammatory cytokine, were significantly increased in PHA408-treated mice, IL-6 induction could be responsible for these findings. Several in vivo and in vitro studies have reported that IL-6 treatments impose a downregulation of transporters and metabolizing enzymes (Morgan, 1997, 2001). In contrast, despite the higher levels of IL-6, PHA408 administration caused an increase in the mRNA levels of Cyp3a11 and Bcrp in PXR (+/+) but not PXR (−/−) mice. This indicates that PHA408 could be an activator of PXR. However, animals were sacrificed hours after administration, whereas induction with most PXR activators requires 2–3 days of exposure (Teng and Piquette-Miller, 2005; Anapolsky et al., 2006). Moreover, we did not see an increase in the protein levels of PXR in the nuclear fraction extracts obtained from the PHA408-treated mice. As only a single time point was examined, this does not fully rule out the possibility that PHA408 is an activator of PXR. The overall findings from this study demonstrate that NF-κB is the main signaling pathway involved in regulation of hepatic drug transporters during acute inflammation. This is the first study to demonstrate that selective in vivo inhibition of NF-κB attenuates endotoxin-mediated changes in the expression of transporters in liver. Although PXR activation is involved in the induction of several of these transporters, it does not appear to play a role in their downregulation after endotoxin treatment. As NF-κB activation is linked to the pathogenesis of many acute and chronic disease states, this information can be used to predict potential drug–disease interactions. We thank Ragia Ghoneim and Yen Ting Shen for technical assistance. Participated in research design: Abualsunun, Piquette-Miller. Wrote or contributed to the writing of the manuscript: Abualsunun, Piquette-Miller. This work was supported by an operating grant from the Canadian Institutes of Health Research [MOP 13346]. W.A.A. is a recipient of the King Abdul-Aziz University Scholarship for Postgraduate Studies. This work was previously presented as a poster presentation at the following meeting: 2017 American Society of Clinical Pharmacology and Therapeutics (ASCPT) Annual Meeting; 2017 March 15–18; Washington, DC. (2017) Regulation of Hepatic Transporters in Mice During Acute Inflammation; Involvement of NF-KB and Pregnane X Receptor. Clin. Pharmacol. Therap. 101(S1):S–98. (2006) Regulation of drug-metabolizing enzymes and transporters in inflammation. Annu Rev Pharmacol Toxicol 46:123–149. (2006) The role of pregnane X receptor in 2-acetylaminofluorene-mediated induction of drug transport and -metabolizing enzymes in mice. Drug Metab Dispos 34:405–409. (2001) Role of transport proteins in drug absorption, distribution and excretion. Xenobiotica 31:469–497. (2000) The acute phase response is associated with retinoid X receptor repression in rodent liver. J Biol Chem 275:16390–16399. (2015) The effect of specific IKKβ inhibitors on the cytosolic expression of IκB-α and the nuclear expression of p65 in dystrophic (MDX) muscle. Am J Transl Res 7:670–682. (2005) Acute inflammatory response to endotoxin in mice and humans. Clin Diagn Lab Immunol 12:60–67. (2014) 1α,25-Dihydroxyvitamin D3 reduces cerebral amyloid-β accumulation and improves cognition in mouse models of Alzheimer’s disease. J Neurosci 34:7091–7101. (2015) Borneol depresses P-glycoprotein function by a NF-κB signaling mediated mechanism in a blood brain barrier in vitro model. Int J Mol Sci 16:27576–27588. (2003) Downregulation of mdr1a expression in the brain and liver during CNS inflammation alters the in vivo disposition of digoxin. Br J Pharmacol 139:35–48. (2005) Impact of endotoxin-induced changes in P-glycoprotein expression on disposition of doxorubicin in mice. Drug Metab Dispos 33:820–828. (2013) The complexity of NF-κB signaling in inflammation and cancer. Mol Cancer 12:86. (2006) LXRS and FXR: the yin and yang of cholesterol and fat metabolism. Annu Rev Physiol 68:159–191. (2009) The nuclear factor NF-kappaB pathway in inflammation. Cold Spring Harb Perspect Biol 1:a001651. (2009) A novel, highly selective, tight binding IkappaB kinase-2 (IKK-2) inhibitor: a tool to correlate IKK-2 activity to the fate and functions of the components of the nuclear factor-kappaB pathway in arthritis-relevant cells and animal models. J Pharmacol Exp Ther 329:14–25. (2011) Inhibition of NF-κB by a PXR-dependent pathway mediates counter-regulatory activities of rifaximin on innate immunity in intestinal epithelial cells. Eur J Pharmacol 668:317–324. (2009) Impact of infectious and inflammatory disease on cytochrome P450-mediated drug metabolism and pharmacokinetics. Clin Pharmacol Ther 85:434–438. (2009) The NF-kappaB family of transcription factors and its regulation. Cold Spring Harb Perspect Biol 1:a000034. (1999) Activators and target genes of Rel/NF-kappaB transcription factors. Oncogene 18:6853–6866. (2010) The role of cerebral vascular NFkappaB in LPS-induced inflammation: differential regulation of efflux transporter and transporting cytokine receptors. Cell Physiol Biochem 25:623–630. (2007) Regulation of drug transporters during infection and inflammation. Mol Interv 7:99–111. (2010) Anti-inflammatory effect of a selective IkappaB kinase-beta inhibitor in rat lung in response to LPS and cigarette smoke. Pulm Pharmacol Ther 23:172–181. (2001) Induction of Mdr1b expression by tumor necrosis factor-alpha in rat liver cells is independent of p53 but requires NF-kappaB signaling. Hepatology 33:1425–1431. (2001) NF-kappaB: a key role in inflammatory diseases. J Clin Invest 107:7–11. (2008) Regulation of transporters by nuclear hormone receptors: implications during inflammation. Mol Pharm 5:67–76. (2005) Nuclear receptors and drug disposition gene regulation. J Pharm Sci 94:1169–1186. (2007) Nuclear receptors and the regulation of drug-metabolizing enzymes and drug transporters: implications for interindividual variability in response to drugs. J Clin Pharmacol 47:566–578. (2008) A gut feeling of the PXR, PPAR and NF-kappaB connection. J Intern Med 263:613–619. (2006) Xenobiotic receptor meets NF-kappaB, a collision in the small bowel. Cell Metab 4:177–178. (2006) Mutual repression between steroid and xenobiotic receptor and NF-κB signaling pathways links xenobiotic metabolism and inflammation. J Clin Invest 116:2280–2289. (2009) Role of NF-kappaB in the regulation of cytochrome P450 enzymes. Curr Drug Metab 10:164–178.